A dislocation is defined as disruption of a joint so complete that the articular surfaces are no longer in contact.1 Brautigan and Johnson assert that the term knee dislocation is a misnomer in the orthopaedic literature because a knee with multiply injured ligaments or the multidirectionally unstable knee has been imprecisely labeled as a knee dislocation.1 For the purposes of this chapter, knee dislocation will be used to denote a radiographically confirmed knee disarticulation as well as the multiple ligament injured knee. 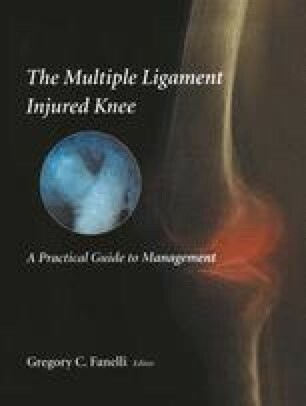 This dual use is somewhat important, since the physical examination will confirm multiple ligament insufficiency in a knee that spontaneously reduced at the time of injury. Defining terms such as dislocation may seem purely academic, but because of this inconsistency, it has been difficult to draw conclusions from the knee dislocation literature on the success or failure of treatment options. Despite these difficulties, there has now been enough written on the topic to obtain a modern consensus on the nonoperative treatment of the acutely dislocated knee.